Whether the Pro S the 2-in-1 for you depends on what you’re looking for. Not one manufacturer has yet perfected this emerging market, and with each showing their individual strengths and weaknesses, this Samsung feels on par with much of the competition in its own way. If it was more affordable it might be an even more attractive option though. Not so long ago Samsung pulled out of the laptop market in the UK, which came as a bit of a shock. It also showed the electronic manufacturer's hand and forward-thinking, to some degree, given that tablet and laptop markets have largely converged in recent years thanks, initially, to the Microsoft Surface. The Galaxy TabPro S is Samsung's direct response to this evolution. A slender 2-in-1 with a keyboard in the box that, given the device's 12.2-inch screen and Windows 10 operating system, feels like a new-generation laptop in many respects. It leverages the maker's well-established tablet-making skills - we're looking at you Tab Pro 12.2 from 2014, which in hindsight was ahead of its time - and brings that into to the modern world in an even more in-demand form. The question, then, is whether Samsung's attempt at the 2-in-1 tablet-meets-laptop is a step beyond the likes of the Microsoft Surface Pro 4, Lenovo Yoga 900, iPad Pro, imminent Huawei MateBook, et al. But given that the TabPro S employs an Intel Core M chipset does its lack of power compared to many of its competitors mean it misses the required punch to be considered best of the bunch? The thing that sets Core M apart from many other chipsets is that it doesn't need fan cooling, which typically means a less bulky build in devices in which it's used. The TabPro S's 7.9mm thickness (or thinness, more to the point) is similar to a high-end Galaxy phone, squeezing its way under the limbo bar and onto the super-slender shortlist. Although, these days, it's all so close that a little power negated for the sake of bulk isn't out of the question: the Surface Pro 4 is only 8.4mm by comparison, for example, and 0.5mm is barely measurable on your average school ruler; while the iPad Pro is 6.9mm, but what's a millimetre between friends? The Pro S's finish is accomplished, but not quite to S7 edge smartphone levels. We like the metal edging and the folds that make this tablet look like it's been almost trouser-pressed in the most elegant of ways. It's a far shout from the earlier and more plasticky Samsung tablets, with no sign of faux leather anywhere. On the ports front things are kept simple: there's a USB Type-C for charging (or transferring files, but not both at the same time) and a 3.5mm headphones jack. No separate power, no full-size USB to be seen, which saw us getting a bit stuck from time to time, when using the Pro S as a full laptop replacement for this review. In that regard the TabPro S is very much Samsung's iPad Pro competitor. And in the same regard that also means there's no microSD port, so you'll need to designate internal storage in advance - our 128GB SSD model ought to hold plenty of files and footage, given that is laptop-like in capacity (a pricier 256GB model is also available). Seeing as we're mentioning Apple, what's distinctly different about the Pro S, particularly for a Samsung tablet, is that it runs Windows rather than the Android operating system. So while it may look like an ultra-enlarged phone from afar, it feels altogether different in use - which we think is more practical. Tap and swipe the screen like a tablet (although not on the setup screens, which made us think it was broken - it wasn't), or magnetically clip the keyboard into place with ease using the pogo pin to use keys and trackpad - it marries those two worlds together rather successfully. That included keyboard-meets-cover, however, presents various niggles. Sure, it attaches with ease and is then immediately in use without needing to make a connection, but the squat keyboard means a small trackpad that's hard to use given its scale, and the obvious lack of a micro-adjustable kickstand are all things that come up short during use. The stand does mean the Pro S is self-standing, though, but in either a very upright or slovenly low-slung manner that won't be suitable for all situations - it's a bit like the original Surface in that regard (i.e. now years behind the current design curve). Detaching it to use it as a cover also isn't especially elegant either, given where the magnetic pin is positioned relative to the rest of the stand; simply it can't be folded forward, you'll need to disconnect the two parts and line things up. Still, it's all functional, it just lacks refinement. Then there's the actual keys themselves. They're plasticky, their travel isn't great, and the compressed key-to-key layout leaves a lot to be desired, despite being full-size keys. We know it's not a full-blown laptop, but that can be felt in use: the S Pro feels closer to a mini Notebook from years ago, rather than an ultra comfortable typing experience. Also of note is the lack of a stylus. There's not one in the box and, despite the promise of one in the future, the C-Pen accessory still hasn't surfaced to purchase. It should, it's just a case of when. But given the £849 starting price, its absence doesn't see Samsung undercut Microsoft's Surface price point, all things considered. With a 12.2-inch screen, the TabPro S is of a similar scale to the 12.3-inch Surface Pro 4 and a little more compact than the 12.9-inch iPad Pro. The Samsung's Super AMOLED panel is made-up from 2,160 x 1,400 pixels, giving it a better-than-HD resolution, but not quite as much pixel-stashing as the aforementioned Microsoft and Apple devices. Does a resolution behind in the numbers game mean poor results? Not at all. The TabPro S has the relevant resolution for its scale, delivering crisp images that are bright given the panel technology used (AMOLED means pixels can be individually activated, for a clean and bright image). However, colours appear a little oversaturated and hyperreal, which, depending on how you look at it, could be seen a downside. Thing is, extra pixels would mean extra power-drain. And we're happy to shed a few pixels from the already decent density here for the sake of longevity, especially in a device that's meant to be used when on-the-go. It's here that Samsung strikes a decent balance: we've been getting around 8.5-hours use per charge, which is about a third better than what the Surface Pro 4 was kicking out during our testing (but not the 10.5-hours max that Samsung claims - although we suspect that's possible in pre-set scenarios). That's a standard office day when running usual tasks - for us that's email, web browsing, word processing, and similar - without fuss. As an added incentive there's fast-charging available via that USB C-Type port, meaning a full battery from dead in just two-and-a-half hours; or worthwhile top-ups in just a matter of minutes if you're dashing between sockets in different places. However, you'll need a sufficient plug for fast-charging to be realised, the Pro S won't re-juice anywhere nearly as quickly if you plug it into, say, a second laptop's USB port to draw the power. That longevity isn't necessarily a surprise, though, as we're talking Intel Core M here (and in its bottom-rung M3 derivative), not Intel Core i levels of power. If you're a Photoshop fiend then, fret not, it'll operate on the TabPro S, as our trial download confirmed, but it won't be as quick at batch processing as, say, a higher-end Microsoft Surface Pro 4. Still, it's not a restricted app version as you'll be stuck to on Android or iOS devices. 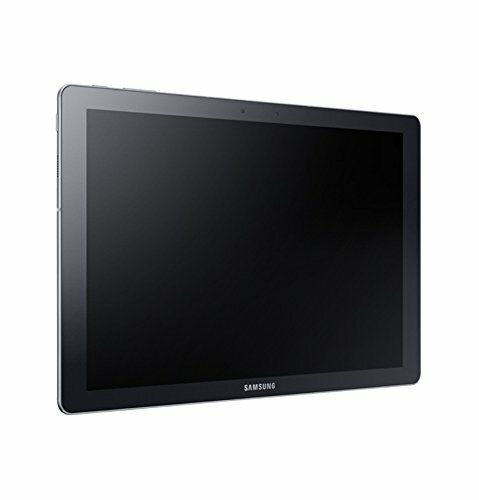 However, given the Samsung only comes in this configuration, and with just 4GB RAM, that's all you can get. Shame there's not 8GB on board to help assist that performance, especially given where phones are headed these days and, not forgetting, the Pro S's £849 starting price. Sure, by and large you'll be paying £1,200-ish for Core i devices with more RAM, but Samsung's positioning isn't as competitive as we might have anticipated. And let's not forget Apple. Comparing the Samsung is tricky, given Apple's choice to use its mobile iOS platform and, therefore, limit on “heavier” installs. For our money the Samsung's use of Windows 10 is more practical as an out-and-out laptop replacement - even if that's not an operating system for all tastes - because Windows 10 is, first and foremost, a desktop operating system with all that offers out of the box. Point being: the Galaxy TabPro S performs the day-to-day stuff well, using a decent screen, with longevity that's commendable. That might make it sound almost average in many respects, but we'd take the additional usage time of this device over the Surface Pro 4 and think the flexibility of Windows 10 (despite its hiccups) that lacks on the iPad (iOS) and MateBook (Android) will suit crossover personal and business users all the more. You're thinking of using your 12.2-inch tablet as a camera? Sound the crazy alarm. However, the TabPro S can cater for your needs, with two 5-megapixel cameras, one front, one rear. They're ok, they take pictures, but nothing to shout about. The main use, realistically, will be the front camera for Skype calls and the like, which it's adept enough to handle. Last up there's audio quality. The speakers - those little drilled holes in the left and right sides of the tablet - are actually fairly decent in terms of volume, although they're not as loud as the iPad Pro and not knock-it-out-the-park in terms of quality. But what did you expect? : this is a slender tablet and doesn't have the capacity for a top-end sound system. It's not perfect though: the included keyboard cover has a tiny trackpad, isn't designed especially well for folding up quickly, and its two-position stand options are restrictive (not a patch on the Surface Pro's kickstand design). As ever, price is a major factor. At £849 with the keyboard cover included, it's pitched squarely against the Surface Pro 4. Thing is, the Samsung lacks a stylus in the box, nor can its Intel Core M3 chipset and lowly 4GB RAM match some of the more powerful competition (although it lasts longer than many). Whether the Pro S the 2-in-1 for you depends on what you're looking for. Not one manufacturer has yet perfected this emerging market, and with each showing their individual strengths and weaknesses, this Samsung feels on par with much of the competition in its own way. If it was more affordable it might be an even more attractive option though.